What would have been for a majority of the country an electrifying moment—U.S. voters electing Hillary Clinton as the country’s first female president—became for more than half of the country one long Edvard Munch-like scream as the reality sunk in that Trump had triumphed in the Electoral College. Among the voting blocs he won, none was larger than the army of angry, hurting white male voters he had conned. And too many of us, like the Clinton campaign, had overlooked the signs of their suffering. For many of those white men, Trump is seen as the great white hope, the last best chance to restore some of the luster to their badly tarnished brand of masculinity. Men in Ohio, Michigan, Pennsylvania and Wisconsin, for example, projected onto the brash New York businessman the image of a rough and tumble “man’s man.” Trump managed to project a caring Big Daddy image, appealing to vulnerable white men concerned not only with their own perilous economic position, but also by women’s social and economic gains. Trump seduced them into believing they’d be able to return to the “glory days” when men were a family’s sole breadwinner, making good middle class money working in plants and factories. He suggested to them they could once again be king of the castle. Trump fanned the dying embers of days gone by; he sang “Happy Days [Could be] Here Again” because he knew that “The Times They Are a-Changing” would have fallen on deaf ears. Truth is, those “happy days” have been over for years. But some men saw in Trump a chance to reverse history; he represented a fantasy of the “re-empowered” men they desperately wanted to believe in. They love Trump for feigning paying attention to them, for temporarily accomplishing the impossible: breathing life into an extinct creature. In his heartfelt, politically astute movie, Michael Moore in Trumpland, the Academy Award-winning director took to a classic old theater’s stage in October in (of all places) Clinton County, Ohio. At one point he offered the audience an imitation of the howling and screeching of white male supporters at Trump’s rallies. “Ah-awwghhhh! Ar-urrrrghhh! Ya-awrrrrghhh,” Moore bellowed. “You know what they sounded like?” he asked. “Dinosaurs dying,” he answered, a sadly apt definition of many white men today. “We had a good run at being in charge guys—10,000 years,” Moore remarked. It was, he said, women’s turn. Apparently it was not to be woman’s turn yet, but there is a tiny silver lining here. 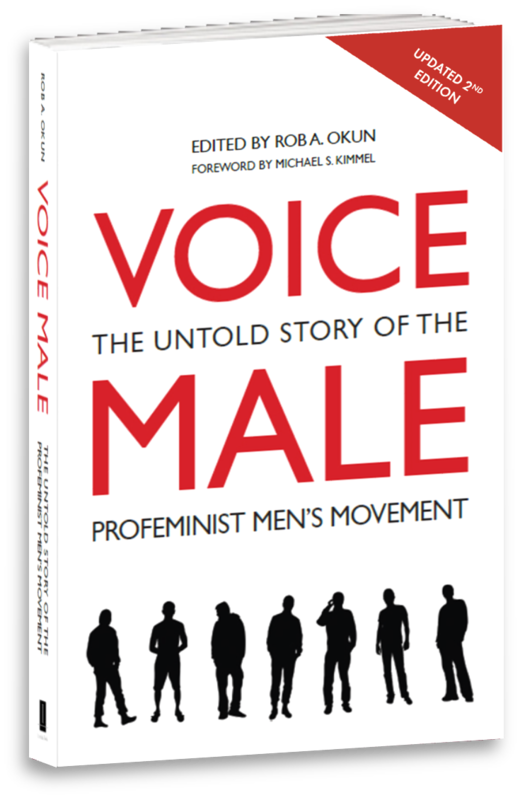 Four decades ago a small—but growing—movement of men began working to redefine manhood. Our voices are still largely unknown, our support of gender equality still beneath the radar. But the election of Trump was an opportunity to recruit new men to the cause. Some of the men who voted for Trump will come down from their high soon enough when they discover they won’t be returning to the coal mines or the auto assembly plants. Maybe this will help spur much-needed change. Beginning several decades ago women were finally able to cross-train, to add law, science, medicine, computer programming and engineering to their old expected standbys—teaching and nursing. Men have been reluctant to learn new skills and expand their professional roles. But we absolutely need caring, sensitive men in what have been primarily women’s professions: health care and education. With a bully and admitted sexual assaulter in the White House now, especially, we need men in classrooms across the country to model a respectful, nurturing, compassionate expression of manhood. What are we waiting for? We’ve tried being angry, sullen, shut down, uncommunicative. We’ve perfected stubbornness and denial. We have so much to gain from letting go of our old ways. We won’t be trapped, isolated, unable to express how vulnerable we feel in economically precarious times. We can see how liberating it is to express how scary and confusing these times are. From that place—with our hearts even a little more open—we can begin to glimpse a manhood that celebrates, rather than fears, our tears and uncertainty. And, we will be able to better relate to women’s reality. Sometimes, before a species goes extinct, it has a last gasp, a final burst of energy. That’s how I am choosing to think about what happened in the presidential campaign. When history looks back at the election of Donald Trump it will, I believe, be recorded as patriarchy’s last stand. Versions of this commentary appeared in newspapers and online news sites including CounterPunch and Women’s eNews.